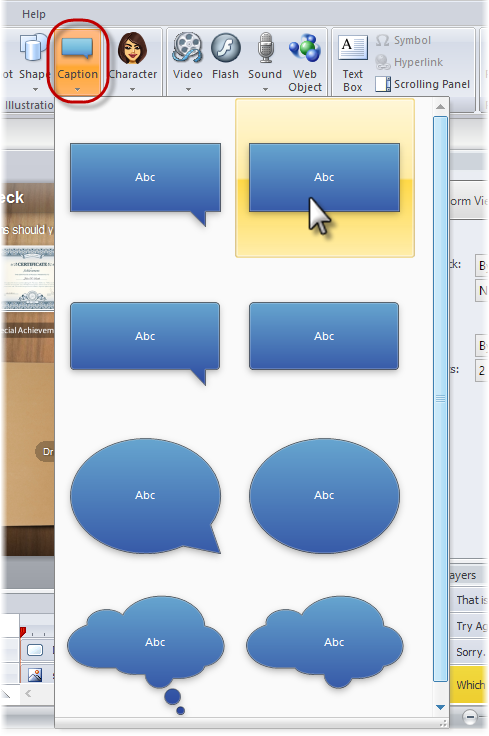 Articulate Quizmaker's caption feature gives you an easy way to create labels, speech bubbles, and thought clouds. In Slide View, go to the Insert tab, click Caption, and select a caption type. Click and drag on your slide canvas to draw your caption. If the caption type you chose includes a pointer, you can make it point anywhere on your slide. Just click and drag the yellow handle at the end of the pointer. If the caption will include text, you can immediately begin typing—there's no need to insert a separate text box over the caption. The default fill color, line color, font, and font color are determined by the design theme of your quiz. Learn about design themes here. To change the look of a caption, select it and use the tools on the Format tab and the text formatting options on the Home tab. Or, right-click the caption and choose Format Shape or Size and Position. Tip: If you change the formatting for a caption and want that same formatting to be used for all future captions you add to the current quiz, right-click the caption and choose Set as Default Shape.